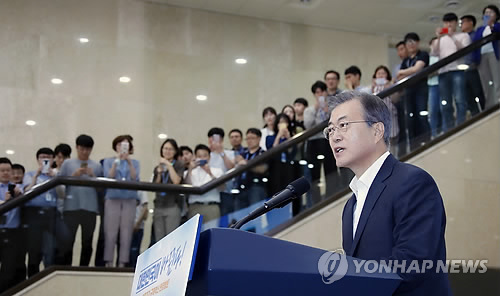 SEOUL, July 19 (Yonhap) — President Moon Jae-in again called for stepped-up efforts Thursday to quickly remove excessive and unnecessary regulations, noting such regulations on medicine and medical equipment may affect or imperil the lives of patients. “Should we be unable to use medical equipment that has been developed through an enormous amount of efforts to assist doctors in treatment and patients to recover due to regulations, there will be nothing more deplorable. In such cases, we cannot but help ask ourselves who those regulations are for and for what,” the president said in a meeting with a group of patients and their families at a hospital in Bundang, just south of Seoul. The meeting also involved the mother of a young boy with diabetes, who was recently indicted for developing an unauthorized insulin-injection application using an unauthorized foreign testing kit. President Moon said the story has forced the government to reflect on itself. “Of course, we must carefully and cautiously approach such issues when they concern the safety of the people and our bioethics. However, in the case of medical equipment whose safety has been proven, there is a need to lower the wall of regulations to allow such equipment to more quickly enter the market and be used,” the president told the meeting. “One well-made medical equipment may help save more lives. It may help identify a disease more quickly and easily. It may help prevent serious illnesses. We must be able to adequately use the innovative technology we possess in saving and treating the people in the medical field,” he added. To this end, the government will work to quickly commercialize new and innovative medical equipment as long as their safety is guaranteed, the president said. It will also simplify the process of government authorization for new medical equipment and supplies. Such efforts are also needed to ensure the country’s leadership in the global market for medicine and medical equipment, Moon said, noting the global market is already growing at a rate of 5 percent a year. “It is a sector where deregulation is not easy, but if we are able to deregulate in the medical equipment sector, deregulation efforts in other areas too may be accelerated,” he added.